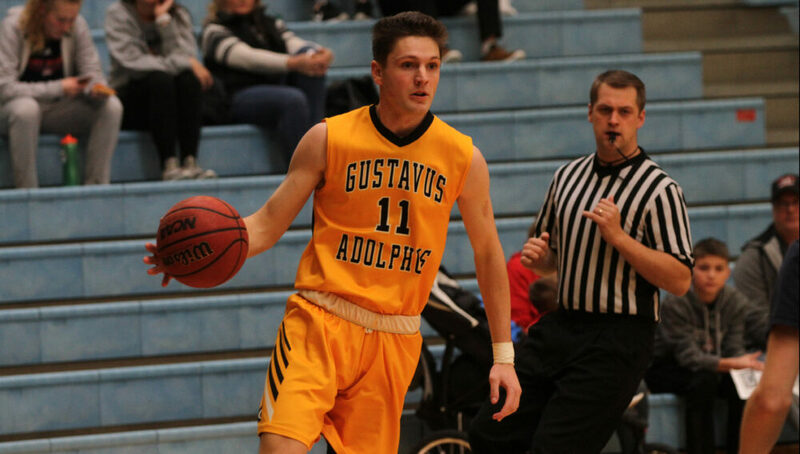 WINONA, Minn. – The Gustavus men’s basketball team traveled to Saint Mary’s Saturday and were defeated by a score of 79-64. With the loss the Gusties fall to 8-11 overall and 5-9 in MIAC play while the Cardinals move to 7-12 overall and 3-11 in the league. The Cardinals took an early 7-5 lead and were able to maintain a lead for the majority of the first half. They extended it to seven midway through the half but the Gusties battled back and then closed out the half on a 7-0 run to go into the break up 33-30. Gustavus shot 44.4 percent in the first half andBrandon Snoberger (Sr., Rice, Minn.) led the team with nine points. Saint Mary’s came out strong the second half going on a 10-3 run to take a four point lead but the Gusties answered with an 11-0 run of their own with the first six points coming from Spencer Tollefson (Sr., New Richland, Minn.). The Cardinals though, answered, scoring eight straight points to take a 48-47 lead. The game went back and forth for a few minutes before Gustavus took a 60-59 lead thanks to a Logan Rezac (So., Andover, Minn.) basket and free throw. Saint Mary’s shut the proverbial door though in the final six minutes outscoring the the Gusties 20-4 to seal the victory. Tollefson led all Gusties with 15 points while Snoberger added 12 off the bench to go along with four steals. As a team Gustavus shot 22-of-53 (41.5 percent) from the field and 5-for-15 (33.3 percent) from the three-point line. Saint Mary’s amassed 10 offensive rebounds in the contest and outscored Gustavus in second chance points 13-0. The Gusties will next be in action on Wednesday when they host Hamline for a 7 p.m. contest.